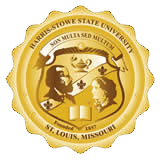 Harris-Stowe State University is one of the most dynamic campuses in the St. Louis area. 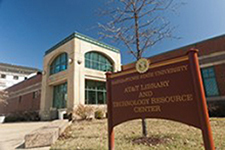 In 1999, the University opened the AT&T Library and Technology Resource Center directly across from the Dr. Henry Givens Jr. Administration Building. The AT&T Library showcases state-of-the-art technology and is a favorite of students and faculty for its research and training facilities. As part of the MOBIUS Cluster of libraries, students have access to comprehensive research materials. It is 21st-century technology for 21st-century learning. 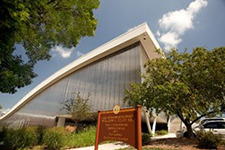 The AT&T Library was built with exceptional access to a variety of technological resources. The Telecommunity Room boasts access to satellite programming and Web seminars and with a capacity of 50, the location makes an ideal venue for distance-learning initiatives. The Seminar Room, also located in the library, is perfect for teleconferencing and live meetings with its boardroom table, which seats up to 20 individuals. The Computer Lab is a favorite room for teaching and training, with up to 20 computer stations for group-learning scenarios. The AT&T Library's Open Access area also contains high-speed Internet connected client stations. A casual environment, the open access area provides an excellent place for students to relax and browse the Web or do major research for their courses. TECHNOLOGY FEATURES AT A GLANCE: Dell 2+ GHz computer stations, MOBIUS access, high-speed Internet, 50-inch plasma display (Seminar Room), 42-inch plasma display (foyer), 8-foot rear projection screen (Telecommunity Room), satellite downlink capability (Telecommunity Room), fixed forward-projection screen (Computer Lab), mobile and fixed audio/video conferencing (Telecommunity Room & Seminar Room). Built in 2009, the William L. Clay Sr. Early Childhood Development/Parenting Education Center is a $17.5 million world-class facility, which houses Harris-Stowe State University’s School of Education. The 50,000 square-foot building also features a library for parents, a laundry room, art area, indoor playroom, a therapy room, nursing room, the observation room, faculty/staff lounge, classrooms, two conference rooms and multiple offices. Renamed in 2005 in honor of Dr. Givens' many years of service to the University, the Dr. Henry Givens Jr. Administration Building is the flagship of the University’s campus. Designated as a historical site, the administration building houses most of the classrooms and support services associated with the University as well as of our state of art Main Auditorium. BUILDING FEATURES AT A GLANCE: The 227-seat capacity theater (seating chart) sound-proof practice rooms, professional dressing rooms, Green Room, 2,490-seat capacity gymnasium, training room, weight room and fitness center, dark room, kiln room, expansive art room and concessions. 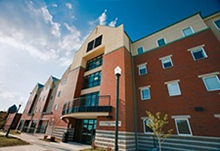 Gillespie is the first residence hall in the history of Harris-Stowe. The HSSU Department of Residential Life is committed to offering services that support the academic mission of the University and to providing opportunities for the students’ growth and development in a living-learning community.